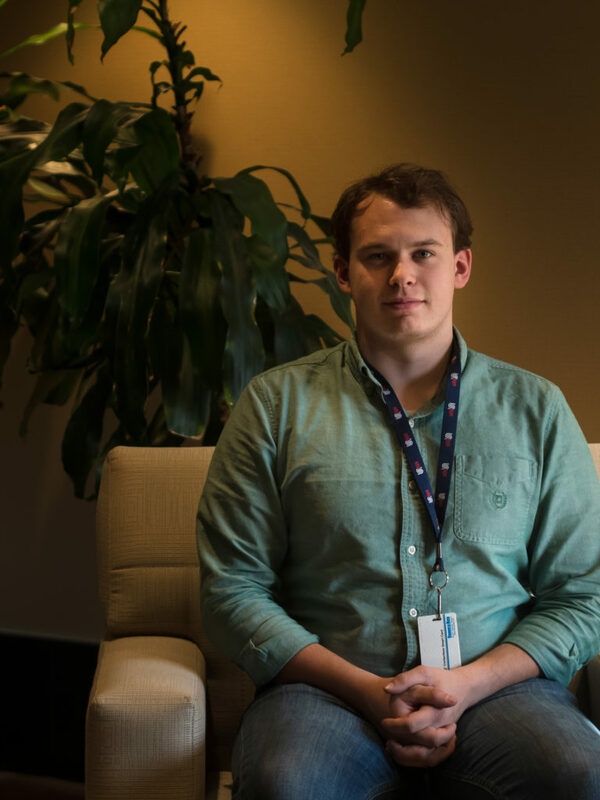 Dustin, a DeltaV ’17 Graduate, works as a Developer at UFG in Cedar Rapids, Iowa. Meet Dustin. He graduated from the inaugural class of DeltaV Code School in 2017. One year later, he’s an application developer at UFG Insurance. He and fellow graduate Jason were hired by UFG less than two months after graduating from DeltaV. As DeltaV students, Dustin and Jason spent 20 weeks together sitting desk by desk pair programming, creating software, and reviewing each other’s code. As UFG Application Developers, Jason and Dustin sit back to back sharing a cubicle, and depending on the sprint, working on the same project and reviewing each other’s code. While this paints a similar picture, Dustin gave us a glimpse into how his life has changed over the last year. 7:00 a.m.: Wake up and get ready for work. 8:10 a.m.: Arrive at work, check email and Slack. Most of Dustin’s day is comprised of writing code and pair programming. Thanks to UFG’s flexible work environment, his team does pair programming through a mix of Skype calls and in-person meetings. Everyday, Dustin’s team gets together for 30 minutes to go over what they accomplished the prior day, any impediments they’re facing, and what they’re working on today. Depending on the day, his standup is a meeting of people in-person or on Skype. He usually spends lunchtime with officemates supporting local downtown restaurants. His go-tos are Pub 217 and Wasabi. After lunch, Dustin spends the rest of his day writing code and pair programming. Thanks to UFG’s flexible work schedule, sometimes he heads home at lunch time and works from home for the rest of the day. 4:30 p.m.: Time to head home. When Dustin isn’t working, he doesn’t have to worry about checking work email or Slack, so he can focus on his hobbies like riding his motorcycle or hanging out with friends and family.